UHV Design specialises in the design, manufacture and supply of innovative market-leading HV and UHV motion and heating products. Our primary focus is to provide high-quality, low-maintenance manipulation solutions for vacuum applications. Excellence is assured through in-house control of the entire process from design, to manufacture, assembly, test and after sales support. A customer-orientated approach combined with a desire to achieve unrivalled product excellence is key to our continued success. UHV Design has developed and manufactured vacuum manipulation solutions for over 15 years. In that time, it has accumulated a ‘production-proven’ product range, positioning UHV Design at the forefront of high- and ultra-high-vacuum manipulation. It also ensures technical knowledge and expertise is maintained within the company. As well as a standard portfolio of products, much of UHV Design’s heritage is based upon working closely with the customer to offer specific custom solutions. Today, a high percentage of business is generated by the company’s ability to adapt and modify standard products to meet the needs of specific applications. Over the years, UHV Design has developed ideas in conjunction with some of the most prestigious and forward-thinking scientific and technical institutions. Many of these products have proved so popular that they have become standard product ranges in their own right. It is our continual process of development, review and improvement that has enabled UHV Design to stay at the forefront of vacuum technology for over a decade. Working closely with our customers has not only enabled us to assemble a genuinely cutting-edge product portfolio, but also gain valuable insight into the challenges that vacuum manipulation sometimes involves. By taking an innovative approach, UHV Design eliminates problems that have become commonplace in standard manipulation product ranges. 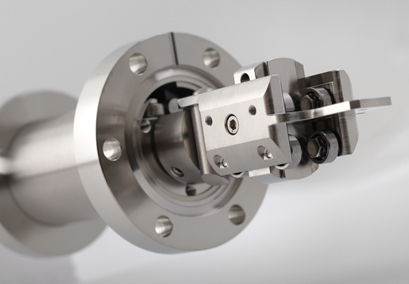 For example, the kinematic movements of our LSM Z shift range, the magnetic coupling technology of our linear and rotary probes, and the choice of materials, bearings and sealing methods across all of our product ranges, have led to a range of significant improvements and developments in the vacuum industry. The rapidly changing face of research technology has led to the creation of new scientific disciplines that rely upon the capability to move components precisely and reliably within ultra clean environments. UHV Design is proud to have supplied manipulation solutions to pioneering laboratories around the world specialising in Nanosciences, Synchrotron and Beamline applications, as well as many others.